Lori Lea Pourier grew up on the Pine Ridge Indian Reservation and is a member of the Oglala Lakota Tribe. Lori has been involved in the arts, social justice and community development fields for nearly three decades and has led First Peoples Fund since 1999. Her early work began at First Nations Development Institute and the International Indigenous Women’s Network. 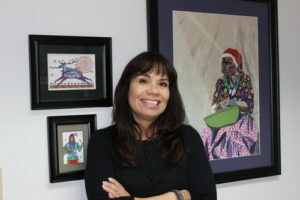 Dedicated to a vision of strengthening Native communities through art and culture for much of her life, Lori focuses her efforts on reconnecting Native communities to their cultural assets and bringing new philanthropic resources to Native artists and culture bearers directly. Lori is a 2017 Ford Foundation Art of Change Fellow. She received the 2013 Women’s World Summit Foundation Prize for Creativity in Rural Life and the Center for Social Innovation Fellowship at Stanford School of Business. She has served on the boards of Grantmakers in the Arts and Native Americans in Philanthropy and was named one of four Native women leading change in Native communities by the Johnson Scholarship Foundation. Lori also contributed to the National Endowment for the Arts’ publication, How to do Creative Placemaking. Lori is currently a member of the Women’s Building Advisory Circle, an initiative of the NoVo Foundation. She is a Core Partner with Arts in a Changing America, and serves as one of the core partner leaders for the Intercultural Leadership Institute, a collaboration between First Peoples Fund, Alternate ROOTS, the PA’I Foundation and National Association of Latino Arts and Culture. Lori holds an MS from Southern New Hampshire University’s School of Business. She lives in Rapid City, South Dakota.